Also called the Ford of Rivendell. Here, the Great East Road crossed the river Loudwater (Bruinen), which was under the power of an Elven-lord (Elrond) and could rise (under his command) to bar passage across the Ford. Really would've liked to see the books version of this scene in LOTR, but I know Hollywood has to have a couple in love in their movies nowadays. Well, it wasn't so much "Hollywood" (or, more appropriately, "Wellywood") as it was a decision to give Arwen more of a role in the film, seeing as the books were dominated by male characters. And there's a long back story to the romance between Aragorn and Arwen, and later scenes in the movie might have made less sense if Arwen and Aragorn did not have any love scenes together. 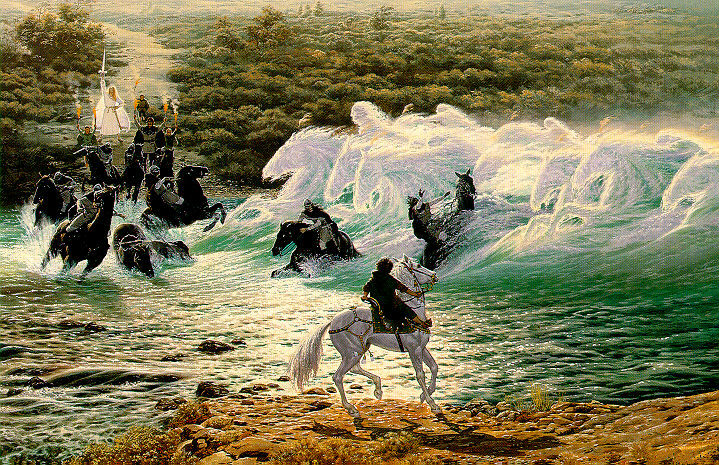 I am happy to see the painting with Frodo on the horse in here as opposed to the Film version! I love the films but there is something about Frodo's defiance that just speaks to everyone. Also, when it comes to good screenplay writing, it would have been too hard to introduce a new character (Glorfindel who wouldn't take part again for the rest of all three films. We must not forget movies are made for the audience, not only for the group of fans (even if i wish it had been the other way around! ) - Glorfindel fan. Rafael, you are absolutely right. If they had chosen to keep Glorfindel in the story, the film would have either been a lot longer in order to explain his character, or audiences who had not read the books might have been confused at this new character suddenly appearing.